An Act to require the Secretary of the Treasury to mint coins in commemoration of each of the Nation's past Presidents of the Continental Congress and United States in Congress Assembled along with their spouses, respectively, to improve circulation of the Half-Dollar Coin. This Act may be cited as the U.S. Founding Half-Dollar Coin Act of 2013. (1) There are sectors of the United States economy, including public transportation, parking meters, vending machines, and low-dollar value transactions, in which the use of a Half-Dollar Coin is both useful and desirable for keeping costs and prices down. (2) For a variety of reasons, the Half-Dollar has not been widely sought-after by the public, leading to higher costs for merchants and thus higher prices for consumers. 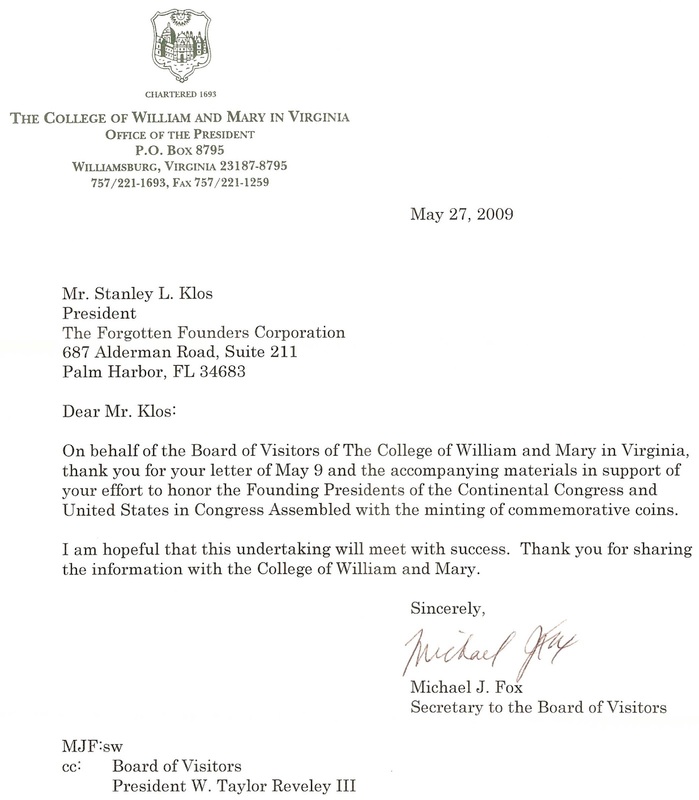 (3) The success of the 50 States Commemorative Coin Program (31 U.S.C. 5112(l)) for circulating quarter dollars shows that a design on a United States circulating coin that is regularly changed in a manner similar to the systematic change in designs in such Program radically increases demand for the coin, rapidly pulling it through the economy. (4) The 50 States Commemorative Coin Program also has been an educational tool, teaching both Americans and visitors something about each State for which a quarter has been issued. (5) The decline of the half-dollar began with the introduction of the Kennedy half-dollar in 1964. Production on the Franklin half-dollar had risen from 20 million in 1959 to 90 million in 1963 due to rising demand. Due to the popularity of President John F. Kennedy, the 1.3 billion coins minted between 1964 and 1970 were taken out of circulation by silver speculators and President Kennedy Admirers. (6) In 1971 the U.S. Mint began making half-dollars out of cupronickel-clad copper but although production reached its peak in 1974 at 280 million coins the Kennedy half-dollars were not utilized in circulation. (7) John F. Kennedy, as currently represented on the Half-Dollar coin, is an important President of American history but the image has now resulted in declined circulation of coin to a minting of only 3.4 million in 2008 with few in circulation. (8) Unlike the current $1 coin that is not being circulated by the public, the shape and size of the half-dollar has been produced nearly every year since the inception of the United States Mint in 1794. The only U.S. coin that has been minted more consistently is the penny. (9) There is a need for a widely circulated high value coin and the re-introduced half-dollar can fill that need. (10) Most people do not realize that the United States of America conducted its war for independence under the Articles of Association which created the Continental Congress whose members elected a President from 1774-1781. Under the Articles of Association the Continental Congress also elected the first Commander-in-Chief in 1775, George Washington, who initially reported to the President. 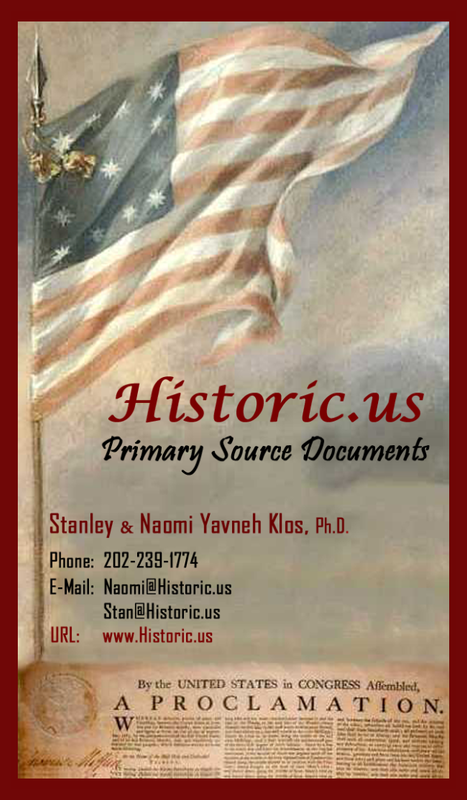 (11) Most people do not realize that the United States of America concluded its war with Great Britain and governed the nation under an unanimously ratified federal constitution known as the Articles of Confederation from 1781-1788. The delegates of this constitutional government elected ten Presidents of the United States, in Congress Assembled. (12) The Continental Congress and United States in Congress Assembled 14 Presidents were leaders of our unicameral government serving the United Colonies and States from 1774 to 1788. 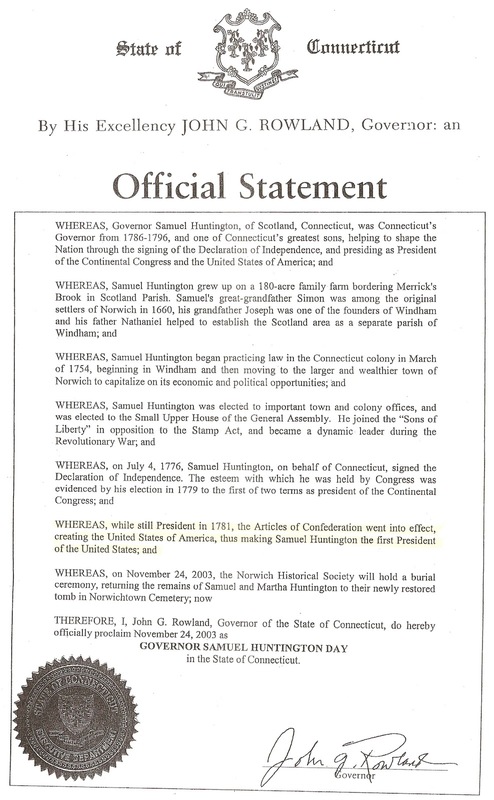 (13) Most people cannot name, other than John Hancock, even one pre-Constitution of 1787 President or evens know there were United Colony/States unicameral presidencies from 1774-1788. (14) During the unicameral government’s existence a second leadership office, Commander-in-Chief of the armed forces was enacted and held exclusively by George Washington from 1775 to 1783. (15) The obverse of these half-dollar coins are designed, at long last, to enumerate and delineate the Presidencies of the Continental Congress, United States, in Congress Assembled Presidency and the office of Commander-in-Chief. (16) Moreover, most people do not realize the government of the United Colonies and States convened in eight different towns and cities during the founding period. There were twelve different buildings utilized as capitols. Additionally, the first Congressional Caucus of 1774 was held in a thirteenth building - Philadelphia’s City Tavern while the unicameral government faded away in Fraunces Tavern of New York City in 1789. (17) In keeping with the $1 Coin order to revitalize the design of United States coinage and return circulating coinage to its position as not only a necessary means of exchange in commerce, but also as an object of aesthetic beauty in its own right, it is appropriate to move many of the mottos and emblems, the inscription of the year, and the so-called mint marks' that currently appear on the 2 faces of each circulating coin to the edge of the coin, which would allow larger and more dramatic artwork on the coins. SEC. 102. U.S. FOUNDING Half-Dollar COIN PROGRAM. (n) Redesign and Issuance of Circulating Half-Dollar Coins honoring the Commander-in-Chief and each of the Presidents of the Continental Congress and the United States, in Congress Assembled on the obverse and the Continental Congress and United States in Congress Assembled Capitol buildings on the reverse. (ii) have a design on the reverse of the Continental Congress and United States in Congress Assembled Capitol buildings selected in accordance with paragraph (2)(A). (i) IN GENERAL- Notwithstanding subparagraph (A), the Secretary shall continue to mint and issue Half-Dollar Coins which bear any design in effect before the issuance of coins as required under this subsection (including the so-called Kennedy’ Half-Dollar coins). (iii) the inscription United States of America'. (vi) Words “Perpetual Union Ratified – 1781” above the Articles of Confederation. (i) the name and likeness of a Peyton Randolph; Henry Middleton, John Hancock, George Washington, Henry Laurens, John Jay, Samuel Huntington, Samuel Huntington, Thomas McKean, John Hanson, Elias Boudinot, Thomas Mifflin, Richard Henry Lee, John Hancock, Nathaniel Gorham, Arthur St. Clair and Cyrus Griffin. (i) IN GENERAL- The inscription of the year of minting or issuance of the coin and the inscriptions E Pluribus Unum' and In God We Trust' shall be edge-incused into the coin. individuals who are blind or visually impaired. (A) ORDER OF ISSUANCE OBVERSE - The coins issued under this subsection commemorating Presidents of the United States shall be issued in the order of the period of service of each President and Commander-in-Chief in the as follows: Year One: Peyton Randolph 1774-1775; Henry Middleton 1774, John Hancock 1775-1777, Commander-in-Chief George Washington 1775-1783, Year Two: Henry Laurens 1777-1778, John Jay 1778-1779, Samuel Huntington 1779-1781, Samuel Huntington 1781, Year Three: Thomas McKean 1781, John Hanson 1781-1782, Elias Boudinot1782-1783, Thomas Mifflin 1783-1784, Year Four: Richard Henry Lee 1784-1785, John Hancock 1785-1786, Nathaniel Gorham 1786, Arthur St. Clair 1787 and Cyrus Griffin 1787-1788. (B) ORDER OF ISSUANCE REVERSE -The coins issued under this subsection commemorating the Capitols of the United States shall be issued in the order Randolph Coin - City Tavern (1774), Philadelphia with the words “First Congressional Caucus”; Middleton Coin -Carpenters Hall (1774), Philadelphia with the words “Articles of Association”; Hancock Coin - Independence Hall (1775-1783), Philadelphia with the words “Declaration of Independence”; Washington Coin - Old Congress Hall (1775), Baltimore with the words “Victory at Trenton”; Laurens Coin - York-Town Court House (1777-1778), York, PA with the words “Victory at Saratoga”; Jay Coin - College Hall (1778-1779), Philadelphia with the words “U.S. Peace Commissioners”; Huntington Coin Independence Hall (1775-1783) with the words “Charleston Surrenders”; Huntington CoinIndependence Hall (1775-1783), Philadelphia words “Perpetual Union Ratified 1781”; McKean Coin - Independence Hall (1775-1783) Philadelphia; with the words “Victory at Yorktown”, John Hanson Coin - Great Seal of the United States with the words “Great Seal of the United States 1782”; Boudinot Coin - Nassau Hall (1783), Princeton with the words “Treaty of Paris 1783”; Mifflin Coin - Maryland State House (1784), Annapolis, “Commander-in-Chief Resigns”, Lee Coin - French Arms Tavern (1785), Trenton with the words “Western Land Ordinance”;Hancock Coin – Lancaster Court House (1777), Lancaster with the words “Congress in Flight”; Nathaniel Gorham Coin - Old Federal Hall (1785-1790) New York City; “Shays’ Rebellion”, Arthur St. Clair Coin – Old Federal Hall (1785-1790) New York City; with the words of “Northwest Ordinance” and Griffin Coin - Fraunces Tavern (1788), New York with the words “Constitution of 1787 Ratified”. (i) JOHN HANCOCK- two coins shall be issued under Subject one as the third President of the Continental Congress and one as the Seventh President of the United States in Congress Assembled. 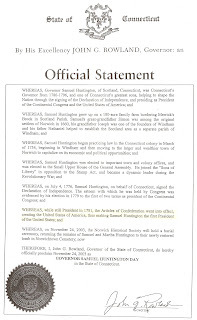 (ii) SAMUEL HUNTINGTON- two coins shall be issued under Subject one as the sixth President of the Continental Congress and one as the First President of the United States, in Congress Assembled. (A) IN GENERAL- The designs for the Half-Dollar coins issued during each year of the period referred to in paragraph (1) shall be emblematic of 4 Presidents or Commander-in-Chief until each President and the Commander-in-Chief has been so honored, subject to paragraph (2)(E). (B) NUMBER OF 4 CIRCULATING COIN DESIGNS IN EACH YEAR- The Secretary shall prescribe, on the basis of such factors as the Secretary determines to be appropriate, the number of Half-Dollar coins that shall be issued with each of the designs selected for each year of the period referred to in paragraph (1). (5) LEGAL TENDER- The coins minted under this title shall be legal tender, as provided in section 5103. (6) TREATMENT AS NUMISMATIC ITEMS- For purposes of section 5134 and 5136, all coins minted under this subsection shall be considered to be numismatic items. (7) ISSUANCE OF NUMISMATIC COINS- The Secretary may mint and issue such number of Half-Dollar coins of each design selected under this subsection in uncirculated and proof qualities as the Secretary determines to be appropriate. 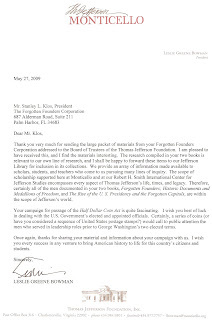 (8) TERMINATION OF PROGRAM- The issuance of coins under this subsection shall terminate when each President has been so honored, subject to paragraph (2)(E), and may not be resumed except by an Act of Congress. SEC. 104. REMOVAL OF BARRIERS TO CIRCULATION. (B) displays signs and notices denoting such capability on the premises where coins or currency are accepted or dispensed, including on each vending machine. 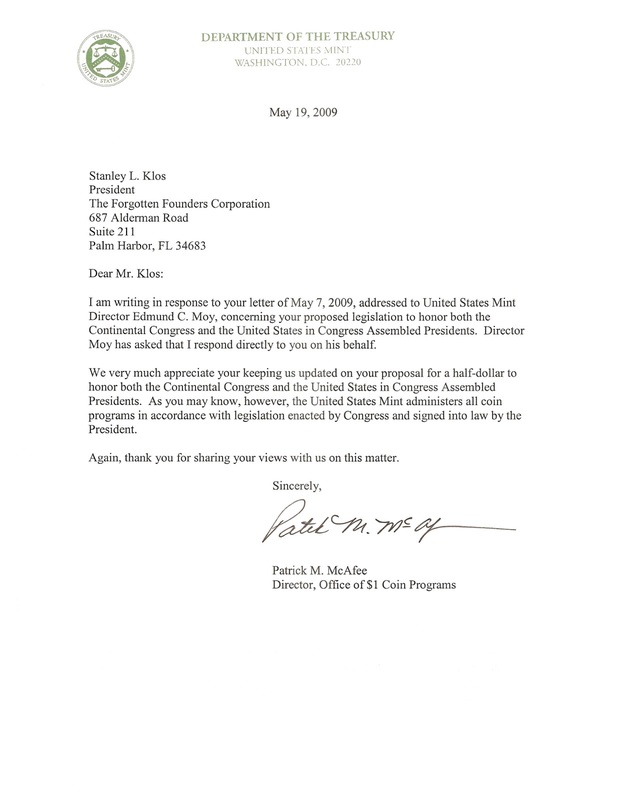 (2) PUBLICITY- The Director of the United States Mint, shall work closely with consumer groups, media outlets, and schools to ensure an adequate amount of news coverage, and other means of increasing public awareness, of the inauguration of the Presidential Half-Dollar Coin Program established in subsection (n) to ensure that consumers know of the availability of the coin. (F) identifying, analyzing, and overcoming barriers to the robust circulation of Half-Dollar coins minted under subsections (n) and (o), including the use of demand prediction, improved methods of distribution and circulation, and improved public education and awareness campaigns. (4) BULLION DEALERS- The Director of the United States Mint shall take all steps necessary to ensure that a maximum number of reputable, reliable, and responsible dealers are qualified to offer for sale all bullion coins struck and issued by the US Mint. (5) REVIEW OF CO-CIRCULATION- At such time as the Secretary determines to be appropriate, and after consultation with the Board of Governors of the Federal Reserve System, the Secretary shall notify the Congress of its assessment of issues related to the co-circulation of any circulating Half-Dollar coin bearing any design, other than the so-called Kennedy-design' Half-Dollar coin, in effect before the issuance of coins required under subsection (n), including the effect of co-circulation on the acceptance and use of Half-Dollar coins, and make recommendations to the Congress for improving the circulation of Half-Dollar coins. SEC. 105. SENSE OF THE CONGRESS. (6) if the Secretary of the Treasury determines to include on any Half-Dollar coin minted under section 102 of this Act a mark denoting the United States Mint facility at which the coin was struck, such mark should be edge-incused. 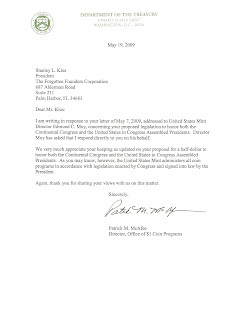 Write President Barack Obama and the committee members urging them to support the proposed Half Dollar Coin Act. Pass on the U.S. 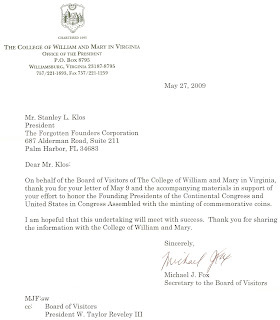 Founding Half-Dollar Coin Act site onto others asking for their support. Write or call the Committee Members listed below. Also let your Congressmen know about the proposal. Purchase a Book, Capitol Posters, Presidential Medallions, Buttons or Trading Cardsto help fund this effort.